Seemingly put up a bit early, a Digimon Frontier Blu-ray box is coming, which should make Frontier fans super happy! The upcoming Blu-ray box will also have an official Twitter account for promotion. The Blu-ray box will be released on April 2nd, 2019 and cost 53,800 yen. It will be an 8 disc set. 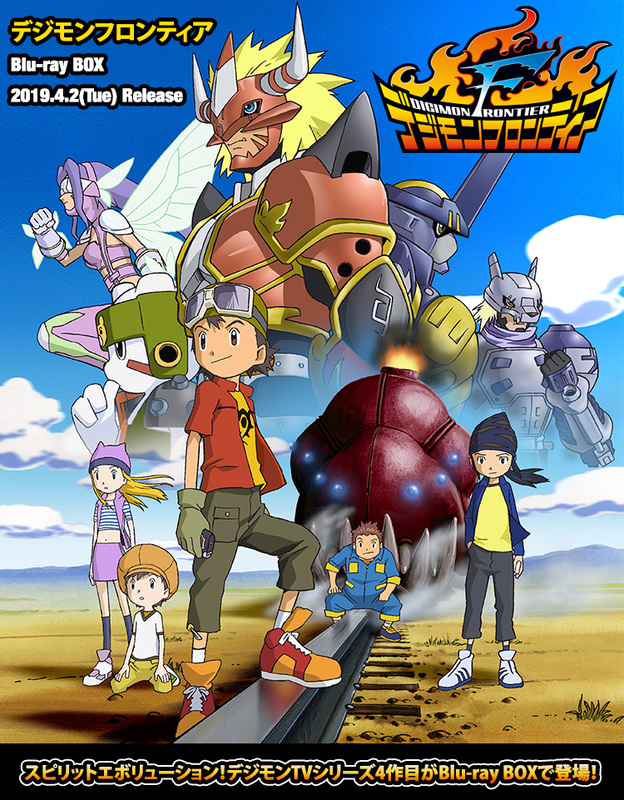 The first press limited bonus will be a brand new Digimon Frontier audio drama on CD. It will have an art box with newly drawn artwork, along with 2 internal digistacks with new art. It will also contain a booklet. It will be based on the Digimon Chronicle Box 03 Digimon Frontier booklets, re-edited based on Memories of Digimon Frontier and Digimon Frontier TrailFan. It will have a clean OP and ED as on disc extras. Amazon Japan- A mini shikishi and 6 acrylic keychains. Toei Online- A fabric poster using artwork from the new box. Yodobashi Camera- A B2 size Fabric Poster and a tote bag. To celebrate the announcement it appears they will put up episode 1 of Digimon Frontier to stream on Youtube soon, we assume this will be gelocked to Japan. And we have a trailer for the Blu-ray box! More Digimon Frontier Blu-ray updates to come! Update- Cleaned up a few things. Ahhhhhhh!!! I'm gonna die of happiness!! Didn't see this coming <3 Insta-buy for me! Hope the special have them all fuse and turn to ancients? Now we just need the Data Squad blu-ray. I really didn't expect Frontier will get this! And a new audio drama after 15 years of its ends? It's like i'm having a pleasant dream. Hope this means that Savers and possibly Xros Wars will get same treatment. As a Frontier fan, I'm thrilled! An instant pre-order from me once the links go up. So much of yes! Hopefully I'll be able to buy this at some point. Frontier is a series I've always wanted to see remastered in HD,and it looks like I'll live to see that dream coming to fruition. I didn't watch the stream; did they say it was nine discs? From what I can see on the website, it looks like there's eight. The blu-ray sets have been eight discs so far; it seems strange that they'd add a ninth disc for Frontier (one of the shorter shows). Either way, YES! The is the one I was hoping for. I wasn't expecting this so soon, nor was I expecting a new Drama CD. I thought something like that would only be produced for fan favorites like Adventure and Tamers. I'm hoping they actually get the entire cast back. I figure, best case scenario, we get the six children *plus* Bokomon and Neemon. Worst case scenario, we just get Takuya and Koji. The other blu-ray Drama CDs have been a ton of fun so far; I'm so excited to hear everyone again. I was *really* hoping one of the bonus items would be another soundtrack CD. The single OST we have for Frontier simply isn't enough. Oh well. Hopefully the bonus features include more than clean openings and endings, as advertised. The Tamers blu-ray was a bit of a let-down in that regard. Fingers crossed that they include the end cards for the show, as well as the "new series" preview (which Tamers' set was sorely missing). I've already got my pre-order in through Amazon Japan. The price will hopefully drop pretty significantly before release date, if the other blu-ray sets are to go by. I almost bought the limited edition. The mini-shikishi sounds cool, but I'm not interested in the keychains. Besides, the Amazon-exclusive edition usually doesn't drop in price, while the standard edition usually does. That shikishi board certainly ain't worth the difference (which usually ends up being a few hundred dollars). As long as I have the Drama CD, I'm good. And with that, my dream has come true. I'm so happy to have the "golden age" shows on blu-ray. Last edited by MagicBox; 07-29-2018 at 08:17 AM.